Four new light-rail lines could be up and running in Toronto by 2020, as a modified version of the Transit City plan that Mayor Rob Ford has vigourously campaigned against comes to fruition. The provincial agency, Metrolinx, revealed the details in a report released Tuesday. The Metrolinx board will vote on the report’s recommendations Wednesday. 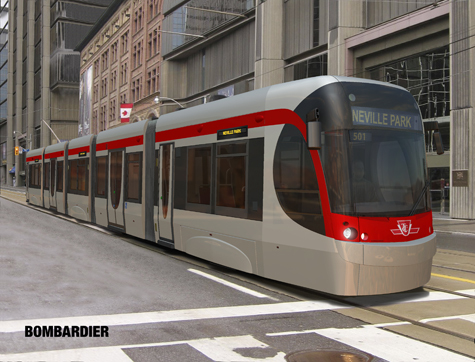 Construction on the the Sheppard East LRT line, which will run from Don Mills subway station to east of Morningside Avenue, is slated to begin in 2014. That was when it was supposed to be completed under the old Transit City plan championed by Ford’s predecessor, David Miller. The line is expected to be in service by 2018. Construction on the Finch West LRT line, which will run from the still-to-be-completed Toronto-York-Spadina subway extension to Humber College, will commence in 2015. The line is expected to be up and running by 2019. Construction on the Scarborough RT line replacement is to begin in 2014, with the line in service by 2019. Construction on the Eglinton Crosstown LRT line, which will run from Keele Street to Kennedy Road on Eglinton Avenue, has already commenced. The line will be in service by 2020. HOV lanes will be removed to accomodate the line. Provincial body Infrastructure Ontario, and not the Toronto Transit Commission, would be responsible for delivery of the project, Metrolinx has recommended. Infrastructure Ontario will also try and secure federal money from a public-private partnership fund to build the projects. The bill for construction of all the light rail lines is expected to total $8.4 billion. None of the construction ai??i?? with the exception of the Eglinton Crosstown line and a storage facility for light-rail vehicles ai??i? ?will begin before 2014, when the next municipal election is scheduled. And the minority Liberal government, which survived a confidence vote earlier Tuesday, could fall before construction on any of the new lines. Ford has repeatedly argued against the construction of the lines, saying that Torontonians want subways, not light rail. But he lost a number of key transit votes in council after refusing to budge on his commitment to bury the Eglinton line. Under the current plan, only the central portion of the line will be underground. Led by TTC Chair Karen Stintz, a majority of councillors rejected Ford’s call for a buried Eglinton line and a Sheppard subway extension and coalesced around the plan that Metrolinx is now moving ahead with. Stintz says Metrolinx is moving in the right direction. ai?? ?Yeah, I think the timelines are aggressive and Iai??i? ?m pleased that Metrolinx is moving as quickly as it is to bring this transit to areas of the city that most need it,ai??? Stintz said. Under Ford’s plan, the entire Eglinton line would be buried. He struck a deal with the Ontario government that would have sent $8.4 billion in provincial funds to bury the line. Any leftover funds would have been allocated to a proposed eastward subway extension on Sheppard Avenue East. However, that agreement was contingent on securing council support. Ford was not able to woo his opponents on council, with many of them criticizing Ford for not having a plan to fully fund the Sheppard subway extension. Not before time, some positive news comming out of Toronto.